Network Device Interface Specification (NDIS) 6.3, included with Windows 8 and newer Microsoft Operating Systems implement new power management capabilities especially for devices such as tablets and 2 in 1 systems..
InstantGo capable devices (aka Windows on Tablets) are designed to minimize power consumption and extend battery life. If Windows determines that a connected device is not being actively used it will attempt to suspend it. 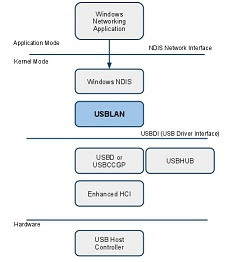 Once suspended if there is network traffic that needs the network link then the USB connection needs to be resumed. This can be done by the host OS and (to be confirmed) by the device using Remote Wakeup. For legacy devices and to transition support there will be three levels of support. The first two being available in USBLAN for Windows v2.4.8. Devices that do not implement remote wakeup (not set in bmAttributes) will work correctly while the tablet is active. If the tablet goes into low power mode the device should not be suspended and may require to be replugged to regain network connectivity. Network connectivity will remain. Power consumption will be higher because the USB Device and Bus remain powered. What I am currently seeing is that Windows treats the device correctly while it is active. I.e. the screen is on and the system is available for use. Once the system goes into InstantOn mode (screen blank, low power mode) the system starts using the SET_POWER OID to change to D3 power state (suspend) and then immediately to D0 (resume). This is repeated every five seconds. Devices that can set Remote Wakeup in bmAttributes can use a setting to prevent being suspended. N.B. 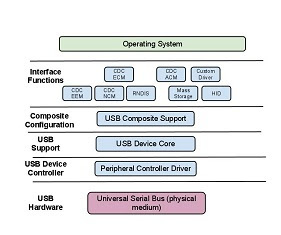 this means that even when the tablet is in low power mode the USB bus will be active and consuming power. What I am seeing is that the IdleNotificationHandler is being called during normal operation (screen on etc) with ForceIdle set to false when there is no traffic. That is being returned with a BUSY status and works well. This will be available in USBLAN for Windows v2.4.9. In this mode devices can (and will be) suspended for if the connection is idle (> 10 seconds?). The host should resume the bus if the host has traffic for the device. The device can use the Remote Wakeup facility to request that the host resume the bus when it has network traffic. Network connectivity will remain (possibly with some latency to resume the USB Bus connection for the device). Power consumption will be lower because the USB Device has been suspended.